KANSAS: Dead Heat In GOP Gubernatorial Primary - Joe.My.God. 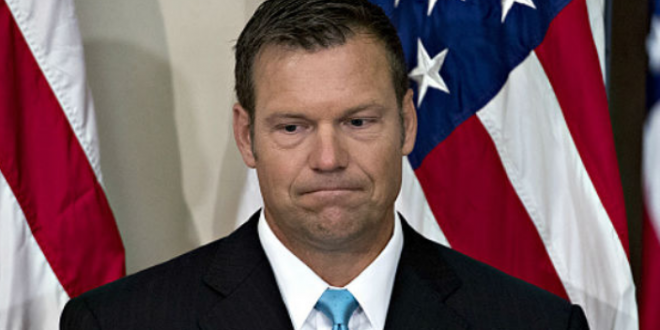 Secretary of State Kris Kobach maintained a minute lead — less than 200 votes — over Gov. Jeff Colyer Wednesday as the final election results in the Republican race for governor were counted. Delays in Johnson County pushed the unofficial final result of Tuesday’s primary into Wednesday morning. Just before 8 a.m., results on the Kansas Secretary of State’s website showed a tie in the GOP election at 41 percent of the vote. Kobach held 126,257 votes over Colyer’s 126,066 votes — a difference of 191 votes. Provisional ballots remain uncounted. A new computer system combined with lengthy lines delayed counting in Johnson County — home to 23 percent of Kansas voters. Meanwhile in the Democratic primary, Sen. Laura Kelly clobbered opponents in her crowded field, taking home more than 50 percent of the vote.